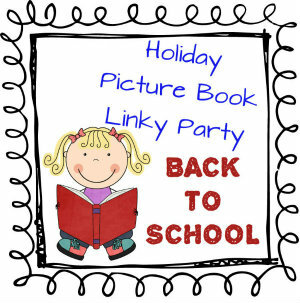 Update and Back to School Book Linky Party! Well, we are finally in Virginia! We have been here since last Sunday. So one full week. I can find my way to Target, Costco and Giant and back without getting lost!! :) We found a nanny for our son, and he starts on Tuesday. I am thrilled to get into my classroom and start getting things unpacked! I will be sure to post lots of pictures of before and after. I wanted to say thank you for the awards that I have received! The Friz in First has awarded me The Versatile/One Lovely Blog Award, Fun and Learning in First has awarded me The Versatile Blogger award, Life in Room 406 has awarded me for The Versatile and One Lovely Blog Award! I am going to try to figure out how I am going to nominate all of these bloggers their awards!!! :) I will have my next post to share those blogs as I finally get settled into my new home, state and life! On to my post for Linky today! Over at First Grade Found Me, there is a first day of school book linky party!!! Click here or on the picture to link up! My favorite story to read is NOT one that is very popular, or very long for that matter, but it is one that is very sweet! It is the story about Little Tooth the rabbit. 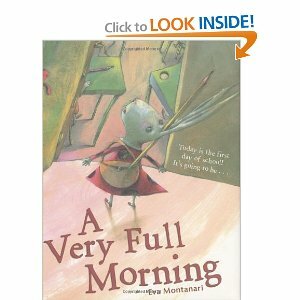 It is called A Very Full Morning by Eva Montanari. We meet Little Tooth the night before school. We hear all about her thoughts and worries. We watch her walk to school and see all the other bunnies. We see her walk in the hall and look in her room. She is the last one to arrive and everyone is watching her. She takes the only seat at the front of the room. She feels scared. Then she says "I am your teacher, and today is my first day of school too"
Run over to Amazon and pick up a copy. Click the link above. I think I will have the kiddos draw a picture of what they would be fearful of and then discuss after. See you tomorrow for the Made it Monday I plan on participating in! I love that book--I think it is good for kids to know that adults still get scared--and we have to face our fears! I found you through the picture book link-up, and I am one of your newest followers. I would love to have you come and visit my blog! Thanks for linking up to the party. That books sounds cute. I've never heard of it before this link up and want to have it now. Congratulations on your new move! I hope you love your new home.